The Cat of Bubastes is the sixth release in The Extraordinary Adventures of G.A. 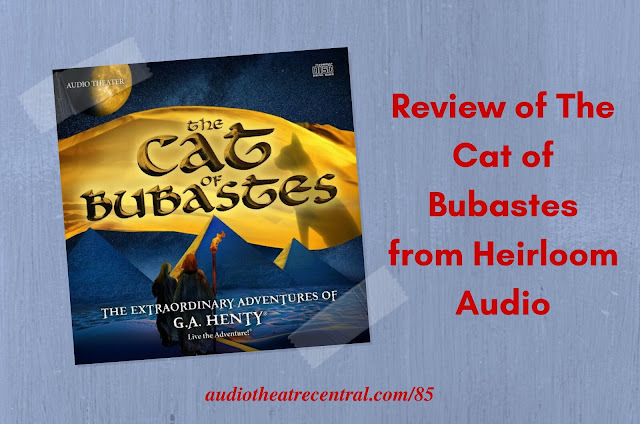 Henty series from Heirloom Audio Productions. This is a gripping tale that will keep you on the edge of your seat. We discuss the production at length in this episode amidst much laughter, while also working in several Old Time Radio references. We also have a few audio drama tidbits and some feedback from Rachel, Richard and Ian. And of course, Roy kicks off the whole thing with a packed newscast. LifeHouse Theatre On-The-Air has announced that they will be producing the biblical story of Ruth as their first audio drama since 2012. The Official Adventures in Odyssey Podcast released a tribute to Alan Young and Janet Waldo, the voices of Jack and Joanne Allen. Brother Francis: The Barefoot Saint of Assisi, a 10-part audio drama written and directed by Paul McCusker is slated for a November 2016 release. If you listen on iTunes, please take a second to rate and review the show! What are your thoughts on The Cat of Bubastes or any of the other things we discussed? Send us your feedback! We’d love to hear what you think!